The Delaware Termination Letter Form is a required notice which must be issued to terminate a lease agreement. This is mandatory whenever ending a month-to-month lease. While a month to month affords flexibility it will require that when either landlord or tenant give at least sixty days’ notice. Additionally, since Delaware is a state which makes certain considerations available such a notice may also be given preceding terminating a long-term lease or fixed term lease. For instance if one must move more than thirty miles away because their place of employment has moved they may terminate a lease but only if they have given thirty days’ notice (Del Code Title 25). Some other acceptable reasons would be if one is starting military duty, must move into senior housing, is a victim is the victim of domestic abuse or stalking are some of the reasons one may qualify to terminate a lease. However, whenever dealing with fixed term leases one absolutely should contact an attorney before issuing a notice. If he or she does qualify to terminate under these conditions they should issue this notice with the time period appropriate to their situation. It should be noted that a lease is a binding contract and thus in many cases termination may be contested. Thus it is highly recommended to consult an attorney and the landlord (when appropriate). Step 1 – The first items that need definition will be the party issuing the letter and dates involved. If the issuer is a landlord then in the first paragraph fill out the day month and year of the lease to be terminated. Then enter the day, month, and year of the termination date. Do not fill out the second paragraph of this letter. Step 2 – Sign your name at the bottom of the letter on the signature line provided. Then, print your name in the space provided below this. 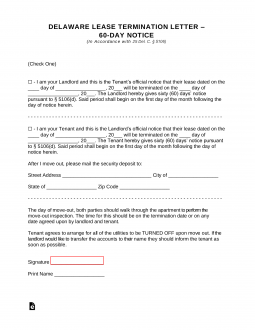 Step 3 – Make sure this notice is issued a full sixty days before the termination date to the tenant. Step 1 – Skip the first paragraph. In the second paragraph, enter the day, month, and year of the lease being terminated. Then enter the day, month, and year of the termination date. Step 2 – In the third paragraph, provide the street address, city, state, and zip code where you may receive your security deposit. Step 3 – At the bottom of the document, sign your name in the space provided. Below this will be an area where you must print your name. Step 4 – Make sure this letter has been issued and received at least a full sixty days before the termination date to the landlord.